Click here to see all available Game Used Hockey Stick Bottle Openers. Note: These are your favorite team's game used sticks, right off of the ice. When searching details online, please realize that players do bounce around the league, so while we can't guarantee they are still skating for your team, we can ensure that your team's spirit is celebrated with each crack of a cold one. The site is easy to use and has a lot of great ideas. The game used hockey stick bottle opener is a great gift for any hockey fan, comes with some history when you look up the code on the small sticker. Very durable and a great conversation piece. Recommend for hockey fans. Ships fast. This bottle opener was perfect for my dad, who is a huge Bruins fan. It is something he doesn't already have of hockey memorabilia and will be a great addition to the man cave. You can look up to see who the player is and the year the stick was in use. Hockey stick opener a hit! 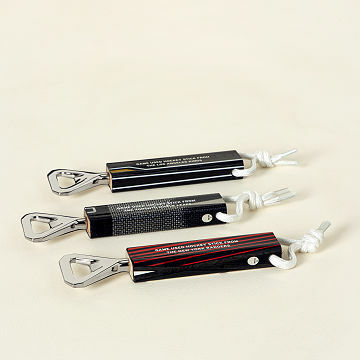 It's a gift- for someone who opens a lot of beer bottles. My brother's an avid Sharks fan, and has a large collection of memorabilia. He probably won't ever use it as an opener, so I can't speak to how well or how badly it opens bottles. My husband thought this game used hockey stick bottle opener was just too cool! The opener is a great conversation piece!